The Appalachian Blacksmith Association is back at the New Deal Festival for a Hammer-In at the Arthurdale Forge. The group features blacksmith craftsmen from across West Virginia. 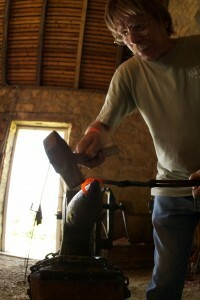 The Appalachian Blacksmith Association is a regional affiliate of the Artist Blacksmiths Association of North America. The Loose Ends Fiber Addicts (LEFA) will be doing a spinning and fiber arts demo during the New Deal Festival. Don’t miss the opportunity to see a spinning wheel in action and to chat with West Virginia fiber artists about their work. Other artisans will also be demonstrating their crafts at their tables.